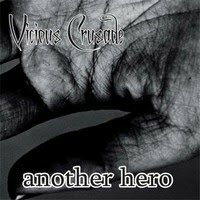 I can't tell you much about Vicious Crusade as must information about the band is just available in Russian. The band from Minsk released this 2-track single to celebrate their 13th anniversary. They offer a new song called Another Hero and a live version of Dogs Of Justice. Slowly they kick off Another Hero, but then add some power and aggressiveness. But the basic of the song is folk rock with violin and vocals of Tatjana Laboda and Dmitrij Basik. The heavy parts are riff-based and show influences of traditional heavy metal bands. Tatjana adds during the chorus some operatic vocals which work well with Dmitrij's raspy voice. An interesting tune which shows their different sounds. Anyway, looks like it's time to check out more of Vicious Crusade's stuff!